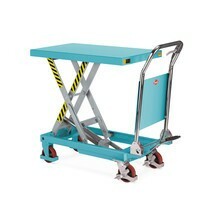 The Ameise® scissor lift table on wheels features a folding handlebar for space-saving storage. Ergonomic working is ensured by the maintenance-free, high-quality hydraulic pump and the infinitely variable lowering valve with precision manual operation. 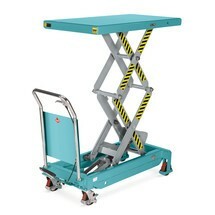 With the Ameise® double-scissor lift table on wheels, you can transport and pick your goods in a comfortable, fatigue-free manner. Thanks to its double-scissor design, the lift table is individually height-adjustable to facilitate effortless, ergonomic working. 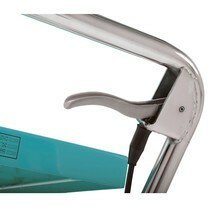 You can choose between a range of models with different capacities and dimensions.